London Jack On Fire for Handmade featured Etsy Artist! You will find High Quality hand Crafted Leather work created with pride and integrity using the finest Leathers and hardware from the UK and USA. An eye for best form, function and durability as well as Classic Timeless Design. Following a lifelong interest in The Old West, many years participation in Old West Reenactment & Living History Encampments, both in the U.K. and the U.S.A. and, through training with Leathercraft Masters, I have developed the necessary skills & experience to fulfill my passion to become a Leather Artisan. High Quality hand Crafted Leather work created with pride and integrity using the finest Leathers and hardware from the UK and USA. All items are made with an eye to the best form, function and durability as well as Classic Timeless Design. So whether you are looking for Old West Period Leatherwork, or a Genuine Carpet Travel Bag, that’s actually Hand Made in England!, you can be sure that its been made to the highest standards and will last you a lifetime. As I keep adding to the inventory of items that I make, please stop by from time to time and have a look at my work, I’m sure you’ll find something of interest. “I take pride in the fact that every item I create is made to last! Only High Quality Leather from the best Tanneries in the UK and USA is used. 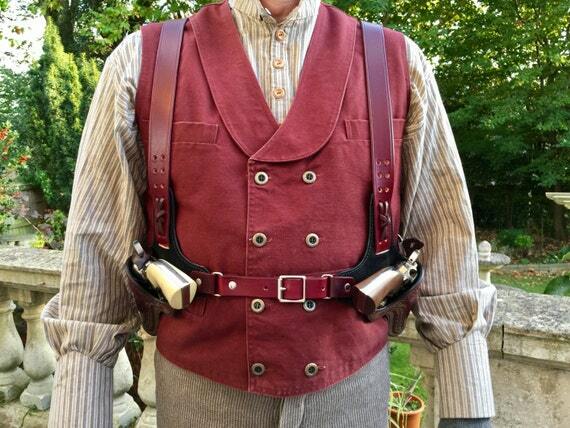 Being a reenactor myself, I know from first hand experience how hard it can be on Gunleather, Cuffs, etc. These items need to be period correct, but also tough enough to stand up to the demands of reenactment. I am proud to say that I have supplied Leatherwork to many U.K and USA re-enactment Club Members.